Light and Salt Ministries has my heart. Why? First of all, I know one of the founders–Tara Germain! She grew up in our community in Northern BC, and I’ve seen her desire to help the less fortunate and to bring God’s love to others in a practical way. Secondly, I believe whole-heartedly in the work that Tara and her husband Alex are doing to give disadvantaged boys a positive future. They are being given opportunities to develop skills and knowledge that will make a difference in their lives, their families’ lives, and in their communities. Tara and Alex began their program humbly and without fanfare; with only limited funds, they saw a need, reached out, and began their school program for boys in their own home. God has blessed, and the kids program, Infantil Tary & Warriors of Christ, have grown in staff members, number of students, and in the activities and educational programs that they offer to the boys and their families. And… the school is housed in its own facility. Tara and the ministry share often with their supporters and friends about the joys, blessings, frustrations, and needs of the ministry. Photos are posted of the boys and of all the activities happening there. Consequently, we feel a part of what is happening. We know what to pray for, what the specific needs are, and what to celebrate. As a ministry supporter, I feel blessed to have a small part in changing lives and bringing hope to the Nicaraguan people being touched by Light and Salt Ministries. Wanda Petersen; Retired School Teacher & LASM Supporter. Fort St. John, B.C. I had the privilege to visit Light and Salt Ministries when I visited Dario, Nicaragua in June 2015. The philosophy there matches, in my opinion, what Christianity should be to the world around us. It is an evangelical program, it is a discipleship program, and it is a practical skills program. How exciting to see God work in Dario, not just in the lives of these boys, but in the rest of the community for generations to come. I had the opportunity to visit my good friend Tara in Nicaragua last fall. Tara and I met when she lived in Kamloops. She was at the beach, saw us out dragon boating on the river and came up to me afterwards. We had that instant connection, like we had been friends forever. All I know now is we will be forever friends. We don’t see each other much these days, in fact I think the last time I saw her (other than this past year) was when she came back to liquidate her things and move to Honduras (after volunteering at the orphanage and meeting Alex). Well enough of the back story. Tara meets me at the airport and we spend the night chatting away. The next day we have a few stops before we drive to Dario, the town she now calls home. I must have taken 20 photos of people hanging off cars and trucks as they maneuvered down the main road. I work in a mine and safety is paramount in everything I do. I was cringing at the normal in Nicaragua. Tara just shrugged and told me you get used to it. Tara has had to get used to many things now that she makes her home in the tropics: one temperature of running water, Geckos in coffee pots and more recently scorpions as fascinators. The things she has gained is immeasurable. The difference in the lives of the boys in her program and their families is amazing. What she can do with a dollar in Nicaragua compared to that same dollar in my pocket here in Canada is outstanding. She is also learning how to run the program and expand it to include not just the boys. Sure you can have experience doing these things but the cultural differences can be hard to maneuver sometimes. Tara takes these setbacks in stride and keeps moving forward. I was able to spend a morning with Tara, Alex, the staff and boys. Yes staff. I am amazed at how Tara has expanded the program so much that she has created employment for other Dario residences as well as helping the boys. The boys were presenting their science fair projects. I have never judged a science fair, but with my science degree and a fascination for teaching, I jumped at the chance when Tara asked me to be co-judge with the science teacher at the local school. The projects were all so well done and leaned a bit towards the entrepreneur type. Some of the boys had never spoke in front of an audience and they overcame their fears, performing brilliantly. One boy was quite sick and didn’t think he could make the science fair. He arrived anyways, walking from his home way on the outskirts of town. He was formally dressed, including a tie. He just couldn’t stay away on such an important day. At the end of the day Tara gave him a lift home. I could not believe that this little boy would walk so far, being sick mind you, to attend “school”. It is a testament to the program and Tara’s vision. I had a lot of time to think during my flight home to snowy Canada. I couldn’t wait to feel the cold, and be cold, after the humidity and heat of the tropics. Mainly I thought about how Tara and I used to hang out before she moved to Nicaragua. We would go for dinner, go to the Blue Grotto, listen to live music and dance the night away. We would share meals at each other’s houses. We would go for coffees at Starbucks. I started to think about the money I would have spent while spending time with Tara. It was easily $25/month. I pledged to continue spending that money with Tara. The only difference now is Tara is able to provide hungry boys with nourishment for their bodies, mind and soul. The difference for me, I may not be able to see my friend every month, but I know she is where she needs to be. I just need to plan my next trip down, maybe when she needs help building her own center with grounds for the kids. I know Tara posts things all the time but I wanted to post something about her and how inspired I am by her. I am glad our paths crossed that day on the beach. Wendy Willis BSc; Metallurgical Technician, Chemical Biology (Scientist), & Mill Operations. LASM Supporter (Visited Fall 2014). Kamloops, B.C. I have watched the faces of the boys in pictures of LASM change over the years. I have seen them go from scared, shy, uncertain, to confident, outgoing, and proud. It looks as if they are actually believing in a future for themselves because of the programs they have been in with LASM. The fact that Alex is now teaching the boys to make sandals and shoes, is such a blessing in their lives. All of this has been done with the love of God and scriptures as a focus. Your work with the widows has also been very special to me. This is one thing that God has exhorted Christians to do, and your program has found a place for them. Employing some of the women to cook, etc has brought dignity and peace of mind in a culture where they are forgotten. I have felt so moved by the work of LASM that I have been a financial support myself, and I have shared the opportunity with a Women’s Spiritual Group I belong to. We, as a group, have also supported the programs that you are bringing to Nicaragua. I want to continue to be a part of your work there, and would encourage others to be involved in whatever manner they are able. This place touched my heart in a way that nothing else possibly could. The impact that the children and their families have had on me is indescribable. The connection grows instantly when a child runs up and wraps their arms around you. The feeling of the need to help these children is overwhelming, my heart just ached to stay and turn these children’s lives around because the things they have gone through and are going through is impossible to ignore. Being able to donate enough money for a child to have a proper heart surgery is an amazing thing to be able to do. One can’t fix a whole country but by helping a single person one can change their lives. We can change their lives as much as they change ours. Being here has changed the view I have on life and has made my heart so much bigger. There’s no doubt this isn’t the last time I will come here and have more to share and more to grow. Donate at no extra cost to you - click to find out how! Wes on Even Apples Speak of His Goodness! Wes on Warriors of Justice – Destroying all Evil!! Suzanne HaabMother of 8 & LASM SupporterFort St. John, B.C. Hamilton (Age 13); LASM Student. Ciudad Dario, Matagalpa, Nicaragua. Carollee Norris; Mathematics Education Consultant & LASM Supporter. Comox, B.C. 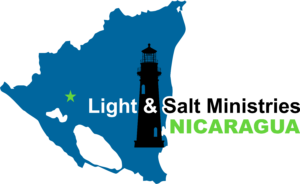 Working with Light and Salt Ministries gives us the opportunity to directly and personally help the needy of Nicaragua and helps us be our better selves. Together we build. Jonathon (Age 11); LASM Student. Ciudad Dario, Matagalpa, Nicaragua.